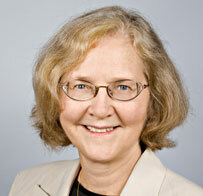 Elizabeth Blackburn, Ph. D. is the recipient of the 2009 Nobel Prize in Physiology or Medicine for the discovery of the molecular nature of telomeres. She pioneered the study of telomeres, the specialized ends of chromosomes, and of telomerase, the enzyme that replenishes the telomeres. Throughout her distinguished career, Dr. Elizabeth Blackburn has spent countless hours in service to her constituency. Further, she has held leadership positions in several scientific societies, including her recent tenure as President of the American Association for Cancer Research. Dr. Blackburn has been recognized for her contribution to the field of telomere biology with numerous prizes, awards, and honorary degrees, including the 2006 Albert Lasker Award for Basic Medical Research and elections to the American Association for the Advancement of Science and the Institute of Medicine. In 2007, Time magazine named her one of the ”˜100 Most Influential People in the World,' and in 2008 she was the North American Laureate for the L'Oreal_UNESCO For Women In Science. The scientific community bestowed upon her the ultimate recognition of her legacy by honoring Dr. Elizabeth Blackburn with the 2009 Nobel Prize in Physiology or Medicine. Chromosome ends, called telomeres, are the DNA-protein complexes that protect the tips of chromosomes. The cellular enzyme telomerase can replenish telomeres, counteracting the natural tendency of telomere length to dwindle down in dividing cells. Despite having highly regulated telomerase activity, in humans the length of telomeres generally declines with age. Such attrition of telomeres serves as a unique and informative biomarker of human aging: more telomere erosion predicts worse risks for many age-related diseases and mortality and, furthermore, is thought to contribute directly to at least some of these diseases. To ensure continued healthy functioning of cells, in humans telomerase activity must be kept in a delicate ³just right² balance, as mutations causing even quite small perturbations of telomerase activity cause high risks of various cancers in humans. New functional aspects of telomerase that are under investigation will be discussed in light of the roles for telomeric maintenance mechanisms in human health.